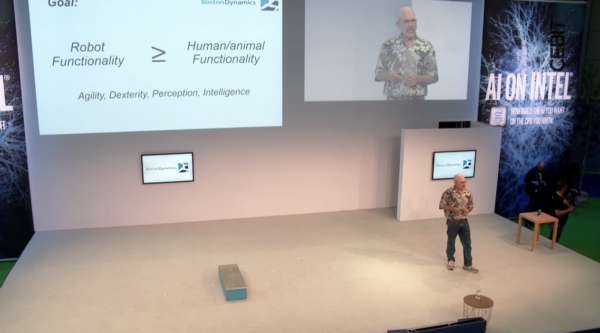 The robot uprising is right on schedule as a new report by Inverse suggests that Boston Dynamics’ terrifying robot dogs will launch into series production by the second half of 2019, producing more than 1,000 of its compact SpotMini models annually. 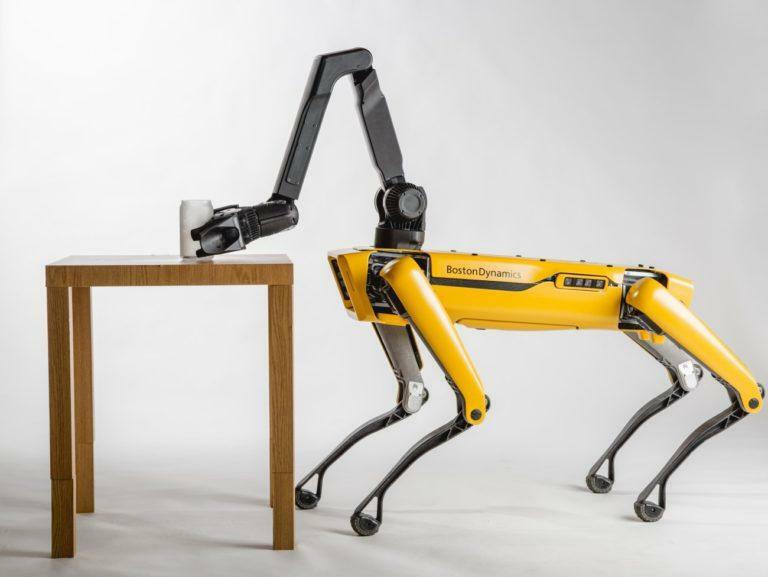 SpotMini is Boston Dynamics’ quadrupedal robotic dog. If you have watched the dystopian sci-fi series Black Mirror episode “Metalhead,” where a knife-wielding robotic dog runs around killing people, then the company’s latest creation should be frightening for all of humanity. It measures two feet, nine inches tall and weighs “66 pounds,” with approximately 1.5 hours of battery life. 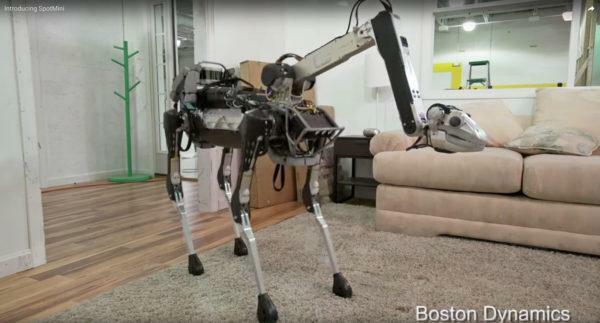 Boston Dynamics recently released videos showing the robotic dog performing all kinds of functionalities like opening doors and increasingly complicated navigational capabilities. “We’ve built ten by hand, we’re building 100 with manufacturers at the end of this year, and at the end of 2019, we’re going to begin production at the rate of about 1,000 a year,” Raibert said of SpotMini, a prototype of which sat on the CeBIT stage near his feet. The broader goal, as reported by Inverse, is to produce a flexible platform for a variety of applications. According to Raibert, SpotMini is currently being tested for use in construction, delivery, security, and home assistance applications. “Of the four areas where SpotMini could become a player, delivery seems to be the one where it has the most competition. Drone delivery efforts — Amazon’s Prime Air Service among them — would use large quad-copters to deliver packages, but they still faces regulatory hurdles (though some are hopeful they’ll be delivering soon. A walking delivery drone wouldn’t have to deal with no-fly zones or line-of-sight stipulations like quadcopters,” said Inverse. Although Boston Dynamics would preferably deliver these robots to the military, it seems as the company could become a household name by the mid-2020s. Why? Well, the company is expecting to explore various rollout options for the senior care industry, as the demographic time bomb of baby boomers is set to explode across the United States in the next decade. At a Softbank expo in Tokyo in 2017, Raibert showed off a model equipped with a camera. “In Japan, the elderly are preparing for robots to care for them, and face a predicted “shortfall of 370,000 caregivers by 2025,” reports The Guardian. With mass production of SpotMini just around the corner, it seems as the company could provide a cost-effective option in dealing with the demographic timebomb in developed countries. 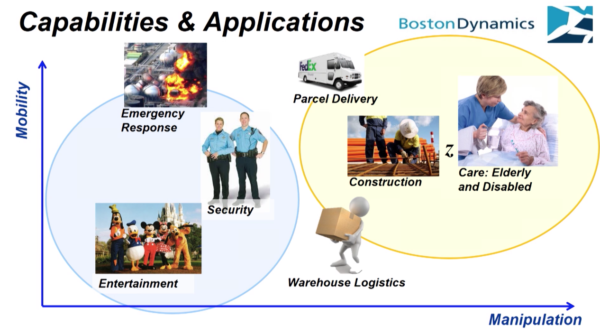 The company can also disrupt other industries such as construction, delivery, and security. Nevertheless, the Black Mirror episode titled “Metalhead” provides a dystopian prediction of how these robots could eventually start killing humans.